More Grumbine Science: Does CO2 correlate with temperature? Lately I've been seeing the assertion that carbon dioxide (CO2) levels have no correlation with temperature changes, particularly not over the last 100-150 years. I discussed a form of this, where the site was asking you to estimate the correlation by eye and doing a misleading job of it. It's a bizarre claim, however, given that even at the eyeball level the figures in that previous note of mine show a pretty good correlation. But let's be quantitative. Eyeball estimation only gets you so far, and eyeballs can be deceived fairly easily (such as by the co2sceptics presenting different periods of data, and drawing in a misleading curve for one set). Also, showing the variation through time, separately, of temperature and carbon dioxide, is not the best way to look at the correlation. Better is to plot the temperature against the CO2 level for that year. I use the temperatures and CO2 values from my prior note. For the period of the Siple ice core (before 1959) I filled in the missing values by straight line fill. Fortunately, in this period the CO2 concentration is changing only slowly. Before going further, though, a couple of reminders. One is, doing this analysis is not how professional climate change predictions are done. The prediction of warming from human-released CO2 was made 60 years before the first measurements of atmospheric CO2 levels. The estimates today of warming from CO2 are done, as was done originally, by examining how the laws of conservation of energy play out in the atmosphere. Second is, this analysis is one that is demanded by the people making the claim that there is no such correlation. They are badly wrong, as we'll see. They're either lying, or failing to do their homework. Either way, not sources to keep using. It's awfully hard to look at this and say that there's no correlation between CO2 and temperature. Since eyeballs can be deceived, we'll be quantitative. While I think the term 'correlation' is more or less known in common language, there are a few technical points I want to be sure we all have in hand. Correlation is a measure of how much one variable (temperature, in our case) depends on another (CO2 for us). It can range from +1 (perfect correlation in a positive sense -- that is, every time you increase CO2 by 10 ppm, you would increase temperature by the same, say, 0.1 degree) to -1 (perfect correlation in a negative sense, every time CO2 increased by 10 ppm, temperature would drop by 0.1 degree). At 0 correlation, there's no connection. But ... all of this is for straight line relationships. If the real relationship is not straight line, you have more work to do. We are going to assume that the relationship is straight line. One last bit before trotting out numbers. Correlation itself is not really our goal even if we compute that number along the way. We generally want to predict some variable given knowledge of some other variable; in our case, predict temperature given CO2 levels. Now temperature varies around year to year. If we have a good prediction method, we can explain most of that variance. If we multiply the correlation by itself (square it), that number tells us how much of the variance we can explain. If a variable explains more than 50% of the variance, we can say that it is the predominant factor. If it's over 10% of the variance, it's notable even if not predominant. Such conclusions also have to be checked for whether they're statistically significant. If I threw dice only twice, their value would 'explain' 100% of the variance in temperature for 2 years (hence the comments about 'you can always draw a straight line through 2 points'). If something isn't even statistically significant, then it is definitely not notable or predominant. It's also entirely possible for a relation to be statistically significant, but not notable -- physically. If we simply look over the whole period of temperature data, we see 78% of the temperature variance is explained as a linear response to CO2 changes. Perhaps you don't trust ice core CO2, or older temperature values. The more recent period shows CO2 explaining 82% of all variation. For either the record as a whole, or for the more recent period, temperature shows a very strong correlation to CO2. Research (see the citations in the IPCC working group 1, 4th report) is showing that it is in the last half century that human-derived CO2 (and others) have been the predominant drivers of climate change. Both the full 158 year record and the recent shorter 50 year record support that -- explaining 78-82% of variance definitely qualifies (at least if it passes statistical significance, which we'll get to in a minute). On the other hand, the same report says that before about 1950, CO2 is not the major driver. Here we see 28% of the temperature variance in that period being from CO2. Consistent with CO2 being a notable component of the system, but not the predominant one in that period. The IPCC estimate for climate sensitivity to doubling CO2 levels (which they took as 550 ppm, see, for example, the technical summary at the above link) is that it is 'likely' (see their definition of the word, it probably isn't what you think) 2 to 4.5 C, with a best estimate of 3 C. Using the highly simple-minded regression above, we get estimates of 2.4 and 2.7 C. Not only does CO2 indeed correlate with temperature, proving false the unreliable sources that started us here, but the sensitivity suggested by that correlation is in the range of what the IPCC arrives at by much more meaningful models of the physics of the climate system. One last piece. Cast your eyes back up to the graph, and maybe click on it to get the full size version. Towards the right hand end, you see a dot that's far above the straight line fit. You're not surprised that this is 1998 -- the year of the major El-Nino that was concurrent with a time of high solar activity. The bit farthest below the curve around 357 ppm CO2 is 1992-3 -- cooling effects of Mount Pinatubo. Even against a statistically strong trend, there are still other effects in the system that can give some tenths of a degree weather variations. There are many reasons climatologists don't approach climate this way, and they're good ones. I only did it because I've been encountering sources that say that the correlation is zero (nonexistent). Those places are wrong. Semi-off-topic, is there a graphic above your table? If so, it's not displaying in any of my browsers. odd. No, blogger just decided to insert a mammoth white space before the table, but only for the browser view. My preview and the raw html have no such space. In your last post you repeat a warning about "misleading yourself with graphs." So I was surprised when in this post you start by graphically showing a linear (!?) correlation between global CO2 concentration and temperature deviation. And sure enough, in the last paragraph you state that there are many reasons, good reasons, why climatologists don't actually approach climate in this way. YEah, and I have to pick a nit as well - your graph shows a correlation between CO2 concentration and average annual temperature deviation from the mean. While I know what that translates into (statistically), most folks won't. They will assume its some sort of scientific misdirection, since when laypeople think themperature, they think in actual degress F or degrees C, not deviations from the mean. Now, having said all that, I'll respond to gmcrews - theres nothing misleading in this graph. No matter the data set, correlations (when they exist) are always pretty much straight lines. You have to get into much more advanced statistics to get other best fit lines - like exponential and polynomials and such. If there was not correlation. the line would end up going in a different direction then the data. SO while your skepticism is noted, I think here it's off the mark a bit. Just in response to the comments by Philip H, I think showing how a correlation is done might be worthwhile here. It would be useful to show that plotting temperature versus CO2 or temperature anomaly versus CO2 anomaly, or either of the other two choices is equivalent because the correlation subtracts the mean from both time series. A lot of people seem to get confused about this, but it is trivial to understand just by seeing the equation for correlation. Shouldn't we expect a logarithmic slope? Chris: Yes and no. The yes side is that if CO2 were the only thing in the system, or everything else were simply proportional to it, then we'd expect to see a logarithmic curve. In fact, I did have the software (OpenOffice 3) compute a logarithmic fit -- but the amount of variation explained was hardly any different than for straight line. The thing is, for the range (changing CO2 from 280 to 385 ppm) currently involved in CO2 changes, a straight line is a very good approximation to the more-correct logarithm. If we included the ice age levels of CO2 -- 200 ppm or so -- that we'd see the significant need for logarithmic dependance of temperature changes on CO2 levels. Shouting and name-calling is neither persuasive, nor going to be posted. Your first complaints should be to the people who prompted my note in the first place. Unlike them, I don't believe that correlation is a meaningful way to approach the question. Also unlike them, I provide a quantitative analysis rather than simply loudly asserting a conclusion. If you believe that I made an error, no problem -- perform the correct analysis and post that. Readers have done so before. If you're not up to doing the analysis yourself, provide a professional citation (ex, textbook, not some random blog) that does so. If you can neither do the analysis, nor provide a professional citation, it might be time for you to re-consider just how wrong you think I am. This article is an example if silly science. No one doubts the correlation between CO2 and temperature, the issue is causality. This article obfuscates the simple fact that CO2 lags temperature and that it is an effect of increasing temperature not the cause of it. Correlation does not prove causality, except in politics, religion, superstition, and apparently in Climate Change Science. Anon: It's really better to read posts that you're commenting on. I noted myself in the start of the third paragraph, and at the end of the article, that this is not how the science is done. And I gave you a source that was indeed making the claim that temperature and CO2 were uncorrelated. By all means go over to them -- co2sceptics (also calling themselves 'climaterealists') and explain to them how and why they're wrong to be saying there's no correlation, and to be pretending that this means something about the science. If you have a scientific source that the current rise in CO2 is due to a response to temperature rise, please do post it. The scientific literature I've seen has continued to support the anthropogenic source since Jan Schloerer wrote his nice CO2 Rise FAQ. But I could have missed something. Who has said there is no corelation between CO2 and temp? The question is causation, not corelation. Contrary to your claim that corelation shows how much one variable "depends on" another corelation only shows how similar their variations are. You have done two deceptive things: First, attacked the straw man who says there is no corelation. Second you have then said that the corelation shows that temperature "depends on" CO2 becasue there is a corelation. In fact, we know for a fact that atmospheric CO2 actually is caused by (or depends on)temperature becasue as ocean temperature rises it can hold less CO2. The CO2 it releases increases atmospheric CO2. That is a known fact. Also, it is a fact that in the Vostok ice core sample, changes in CO2 follow temperature changes over a 500,000 year period. This would indicate that the likelihood is that temperature is the cause of the CO2 variation or that there is another variable that is causing both. In response to your comment asking for a refernce for CO2 as the lagging variable, the following is from CO2science.org. There are many others if you actually take the time to look. In investigating this question, Siegenthaler et al. say they obtained the best correlation between CO2 and temperature "for a lag of CO2 of 1900 years." Specifically, over the course of glacial terminations V to VII, they indicate that "the highest correlation of CO2 and deuterium, with use of a 20-ky window for each termination, yields a lag of CO2 to deuterium of 800, 1600, and 2800 years, respectively." In addition, they note that "this value is consistent with estimates based on data from the past four glacial cycles," citing in this regard the work of Fischer et al. (1999), Monnin et al. (2001) and Caillon et al. (2003). Clearly, therefore, it is temperature that is the robust leader in this tightly-coupled relationship, while CO2 is but the humble follower, providing only a fraction (which could well be miniscule) - of the total glacial-to-interglacial temperature change. Siegenthaler, U., Stocker, T., Monnin, E., Luthi, D., Schwander, J., Stauffer, B., Raynaud, D., Barnola, J.-M., Fischer, H., Masson-Delmotte, V. and Jouzel, J. 2005. Stable carbon cycle-climate relationship during the late Pleistocene. Science 310: 1313-1317. Haven't read your analysis in detail but it looks very thorough. I do agree that CO2 concentrations have increased and think that CO2 correlates with temperature but does your analysis exclude the possibility that increasing temperature is driving the increase in CO2? Gary: The 'who' is answered in the first two paragraphs -- co2sceptics, who renamed themselves climaterealists. I did not make them up. Please do follow anonymous over to that site and educate them about the reality of there being a correlation. It's nice to see someone provide, finally, a citation. But it will be better to see one that is relevant. The question at hand is not the last 2.5 million years (the Pleistocene of your source), but the last 150 years. Over the Pleistocene, the climate has mainly been driven by variations in the earth's orbit -- the Milankovitch cycles. For long time averages, where long has to be thousands of years, that's very important. What you need to provide is a scientific source that the CO2 variations of the last 150 years are driven by temperature variations. While at it, disprove the anthropogenic source for the atmospheric CO2 increase (see Schloerer's document for a start on the scientific literature involved). You'll also do well to observe that the 'temperature drives CO2' mechanism never did take CO2 levels over 280-300 ppm, while they're now over 380. Are you contending that temperatures are vastly warmer than any time in the last 650,000 years (the span covered by the source you cite)? If two variables (let's say A and B) show a correlation, and it's siginificant, then one usually has 3 options: A drives B, B drives A, both A and B are driven by something else. That collection of options is why, as I observed both early and late in the post, we don't do the science this way. I only observe that the two are correlated, contrary to the assertion from co2sceptics/climaterealists. They're not the only ones saying it, but were the ones that prompted my note. I've been enjoying chatting to him there and will draw his attention here. Nice to talk to a polite critic with interesting points to make. Also, the vostok ice core does show warmer temps in 2 out of the last 3 ice ages then we have now. Your statement that we are much warmer than in the last 650,000 years is wrong. Regarding temperature never drving CO2 above 300 - That is irrelevant. No one (or no one with any respect) is arguing that CO2 increase since 1940 has not been caused by people. What they have said is that this increase is not the main cause of warming. I don't understand your paragraph stating that I need to show that CO2 in the last 150 years is driven by temperature variations. This is a dynamic world and a lot of things affect both temp and CO2. Some may drive both and man has added a lot of CO2. You need to show that CO2 drives temp before you ask me to modify my life style, pay more taxes, etc. No one has done that. If I was asking you to make a lifestyle change for a theory that said that CO2 does not affect the sun with no proof, you may be correct. There is a much stronger case that Solar activity increase keep gamma rays from reaching the atmosphere which inhibits cloud formation, which increases the temperature on earth, along with the much smaller impact of greater warmth from the sun at the same time. The corelations between solar activity and temp are strong and there is a mechanism other than just increased heat that has been verified by experiemnts. Who would ever think that we should consider changes to the sun as the cause of changes in earth's temp? One final word: The head of the Hadley Center said a while back that decreasing global temperatures are not evidence against global warming. It is an argument similar to the one you are making. I understand that cooling temps are not proof that global warming has stopped, but can you at least admit that cooling temperatures are evidence that warming has stopped? I see this all over the place. He does not say that there is no corealtion. He says that there is good but lagging coreltaion on the 1000's of years and hundreds of thousands of years time scales and that there is not corelation on the 10's of years and the millions of years. He then points out that there should be corelation on all time scales and that there isn't. He is not saying there isn't any corealtion, just that there isn't on every time scale, which is evidence (not proof but evidence) that temp is not as driven by global warming as we are being told by the alamists. He is also pointing out that the theorectical (and generally accepted) relationship is logarithmic, causing a decreasing effect on temperature from CO2. These are arguments against the sharp increase of temps predicted by Al Gore and others based on a straight line correlation. If only there was a correlation between atmospheric CO2 and temperature! AGW asserts that there is a linear relationship between CO2 levels and temperature: as Gore said in his movie, the higher the CO2 level the hotter the temperature. 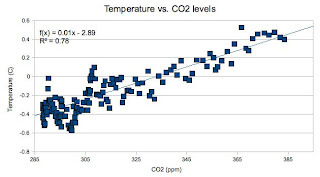 Therefore if AGW was correct there would be a (linear) correlation between CO2 and temperature – correlation is not causation, but a lack of correlation proves there is no linear causation. He's also wrong about anyone in the science expecting a linear relationship. If climate were to show a cooling, then I'd agree that climate had shown a cooling. If weather shows a cooling (which, interestingly, it doesn't for either the 10 years 1998-2007 or 1999-2008 -- slopes from annual average UK global means are positive for either 10 year period), then I'll agree weather shows a cooling. But I won't agree that a weather cooling means climate cooling. See my earlier post Results on deciding trends, which shows why you need 20-30 years to be speaking of a climate trend. The temperatures of the last 20, 30, 40, ... years show a warming trend. So climate is warming. There are quite a few people who claim that humans are not causing the observed increase in CO2. Now that you're agreeing that, indeed, humans drove the CO2 changes of the last several decades (why do you start your clock in 1940, rather than the early 1800s of the scientists studying the topic?) you should understand why it is meaningful to look at this period separately from the period when humans were not driving the CO2 changes. With that in hand, you should also understand why the lead/lag relationships during the ice core era are not useful, or at least not useful in the way you seem to think. The ice core CO2 lagging temperature, plus the rest of that story, shows that CO2 feeds back on temperature. Warmer temperatures give more CO2, which gives more warming. In the present context, however, humans cause the CO2 increase. The same feedback, though, means more warming, more CO2, etc. This amplification is not part of the standard climate models, so they are, if anything, underestimating the expectable change. 1) Please put your comments on the threads they're about. Your followup of the thread on 20 who claim CO2 does not correlate with temperature belongs over there, not here. 2) Before trying to repost, pay a little more attention to what the claims are about. My examination here was about correlation w. temperature during the period of humans driving the CO2 changes. Of course, then, I looked for sources which looked at this short span, vs. the thousands and up year periods. That's what's relevant to the claim. It would also be easy to make it 20 who claim there's no correlation during the ice age cycles either, but that's a different matter. To play the contrarian here, I'd point out that CO2 doesn't really correlate with temperatures in that manner. It's more like this: The logarithm of the CO2 concentration correlates with the equilibrium temperature. I have a 150-year hindcast model that is based solely on (log of) CO2, which calculates not the temperature, but the rate of temperature change. It works. I see that it'll be a good thing to write up a little note on correlation, what it does or doesn't mean, and what one can or can't do with it. Joseph, the details you point to don't contradict at all the results I present. The linear correlation at zero lag (temperature and CO2 for the same year) is as I said. Your real argument isn't that this correlation doesn't exist. It is that you can get a higher correlation by using logarithm of CO2, and by looking at CO2 leading temperature changes by about 10 years. That's entirely consistent with the results I show. It's also expected physically that the response will be logarithmic, rather than linear, and a 20 or so year lag for temperature to catch up to CO2 levels. The problem with the discussion here is the implicit assumption that "is correlated with" means the same as "causes". I've worked in engineering for 30 years and seen many instances in which missile system bugs were chased for lengthy periods of time because the symptoms were correlated with something that turned out to be a coincidence. Pharmaceutical trials are carefully designed to remove biases due to coincidental correlations. I understand that the climate does not lend itself to traditional experimentation, but that does not excuse public policy makers from taking the relative lack of rigor involved in climate studies into account. Also, many charts depicting historic temperature versus CO2 levels appear to show that temperature changes lead CO2 changes. It's difficult to perceive a causal relationship there when approaching the problem without a preconceived conclusion. Is it not just as reasonable to theorize that temperature changes cause CO2 level changes? Anon: I'm not assuming that 'is correlated with' means 'causes'. That's one of the reasons I do mention that we don't approach the problem this way in the science. It was reasonable -- to about 50 years ago -- to hypothesize that CO2 might just be responding to temperature increases, or any of a number of other parts of the climate system. Since then, however, we've been observing not only the amount of CO2 in the atmosphere, but the composition of the carbon (the 3 isotopes) in the CO2. The isotopes carry the fingerprint of human activity, in particular burning fossil fuels and making cement. For more detail on how this was figured out, see Jan Schloerer's CO2 Rise FAQ. So, for the rise of the last 150 years, no, it is no longer supportable to hypothesize that the CO2 is responding to the climate system. Humans have taken over control of the CO2 trend. The 'historical' charts you're referring to, if you are seeing some from the science, are charts for ice ages. I'm hard pressed to consider 4,000-800,000 years ago to be historical. But it is indeed information about the climate system. It tells us that absent significant human activity, CO2 feeds back on temperature. The ice age cycles themselves were driven by orbital variations. But the CO2 amplified the effects of the orbital changes. Since you're an engineer, you can easily carry out your own lead/lag experiment on the data I used. The correlation I gave was for zero lead/lag. I actually computed the correlation for CO2 leading temperature by 10, 20, 25 years -- and it was higher than for 0 lead. But pull down the data yourself, I do give the links, and compute the correlations over the past 160 years for leads of -30, -25 ... +30 years. Penguindreams said "we've been observing not only the amount of CO2 in the atmosphere, but the composition of the carbon (the 3 isotopes) in the CO2. The isotopes carry the fingerprint of human activity, in particular burning fossil fuels and making cement." Horatio looked into the carbon isotope issue a bit in Upward Slopes and Isotopes and would simply have to say at this point that those who challenge the claim of scientists that "CO2 emissions from fossil fuel burning are primarily responsible for the significant rise in atmospheric CO2 concentration in recent times" are simply ignorant of the science (at best). My issue is (and you somewhat addressed it) is that I can correlate many things extremely well but they do not mean anything. If you look at public school test scores and average per capita income in that school - there is an extremely high correlation. But what does it mean? Nothing - it doesn't tell you if those classroom ahve small class size, or that higher income people have smarter children, etc. So when anybody just says "Look at the graph, its obvious that CO2 is causing temperature increase" - its just not that simple. Secondly, taking roughly 130 years of data and analyzing climate change is like taking a drop of water from a lake, looking an the pollutants and determining that is what every drop of water on our planet is like. Even using ice course for 600,000 years is still only 0.00013% of the history of the earth. The earth has been much hotter than it is today some estimate that at one point was 27C warmer approx 2mya. DCM: The correlation may or may not mean anything. More work is required to establish whether it does. But, for those who claim that there's no correlation, this is a straightforward demonstration that they're wrong. Your second para is seriously wrong in two different ways. First part is the sampling problem. Taking 130 years of climate out of the 4.55 billion years of earth history is 1 part in 35 million. 1 droplet of water is about 1 milliliter, so the comparable sampling is 1 droplet out of a 35 ton tanker. The ocean is 1.4e18 tons. You have exaggerated by a factor approaching a hundred-thousand-million-million times. In practice, we often do examine tankers from single drops, or the waters of a large harbor from a bottle sample. You continue that even the entire history (it's now closer to 800,000 years) of the ice cores is too little. For some issues, it would be. But ... the entire span of our species is markedly less than even that 'short' period. If you want to hold the position that anything short compared to the age of the planet is ignorable, fine. But you then must consider that it's ok to exterminate our species. I disagree rather strongly with that approach. So, tell me, what was the population of New York City 2 million years ago? 120,000 years ago? Does the climate then tell you that modern New York City of 8 million people would be just fine regardless of all possible climates? It certainly doesn't tell me that. All that the paleoclimate record tells you in that respect is that life on earth has survived all climates of the last 3.5-3.8 billion years. Nobody, certainly not me, is saying that all life on earth will be killed. I just think it would be bad to seriously disrupt life for the soon to be (and never before experienced) 7 billion humans on the planet. I'm surprised no one brought up pirates vs. temperature. That's the straightforward criticism of this type of analysis. You have two non-stationary series trending upward. That they associate is not surprising. It could be coincidence. There are ways to address this. BTW, let me plug my own analysis where I address exactly that. It is not very surprising to me that there is a correlation between CO2 concentration and the deviation of the temperature from some chosen baseline. Fine, as it is clearly stated that it is a correlation, saying nothing about causation. It is therefore reasonable to also look at other interesting correlations. While it is the stated objective to contradict people who say 'there is no correlation between CO2 concentration and temperature' I would rather look for additional value in the exercise. My point is that there is a much better correlation between the Solar Wind AA Index and temperature than there is between CO2 and temperature. When it comes to suggesting causation, viewing the two correlation charts gives credence to the suggestion that Solar activity primarily drives the temperature and the CO2 level is an effect, certainly historically. To suggest the opposite, that CO2 is primarily responsible and the Solar Wind is an effect is implausible. Thus the CO2-Temp correlation graph has additonal value in context, not just as a point of refutation without really getting into the obvious implications for causation. Nice example of "correlation is not causation". You need to, at the least, combine anthropogenic forcings from sulfates with CO2. For much of the instrumentation period they had nearly equal values but opposite signs. I'd suggest using something like this. The idea is a direct correlation between CO2 and temperature is a very unphysical assumptino. The one thing that is wrong with your analysis is the graph itself. Anyone can select the scale to fit whatever outcome they would like to see...in this case it is slope. I would propose that to find what the true correlation is, have both axes scaled at the same proportion. If you do that the graph and "trend line" will be much flatter and the end result will be different than what you have shown. Another point is that while a correlation might appear to exist, you have failed to identify what causes what. Higher temperatures releases CO2 from the ocean placing more CO2 into the atmosphere and voila, you have a correlation but the rise in temp is driving the rise in CO2. A reminder to commenters -- I note myself that the only thing the article demonstrates is that the two are correlated. I do that because there are people saying that they aren't. It's rather trivially false, as the article showed. To show causation does indeed take a lot more work. That's why the attribution problem is the subject of many papers. The correlation is the same. The slope is different because I rescaled the y axes. But correlation is identical. I'll take this up at more length in a full post of its own. a) We expect that the dependence of temperature on CO2 would be logarithmic if CO2 were the only greenhouse gas. It isn't the only greenhouse gas, so the results may well be different than logarithmic. In the post I'll show you this, and some other, related, points. b) I don't really follow your comment about prediction. Nobody I know, and certainly not me, is making predictions about climate change based on just extending a correlation, whether of a linear function or a logarithmic one. The relationship here suggests another 3 C warming for going from 400 ppm (which we're almost at) to 700 ppm. That give about 4 C for the increase from 280 to 700 ppm. Probably on the low side of more detailed estimates. In the full post, I'll see what is suggested if we look at a logarithmic dependence. In the mean time, I'll also point to going the other way. That actually shows the logarithmic effect better. The 100 ppm rise from 280 to 380 gives about 1 C warming in the simple regression. The 100 ppm decrease from interglacial to glacial corresponds to 5 C cooling. Not all the cooling is due to lower CO2 in glacial periods. Some is the change in the earth's orbit, and some is from growing ice sheets (which then reflect solar energy). Still, some of the 5 C is indeed CO2-related.